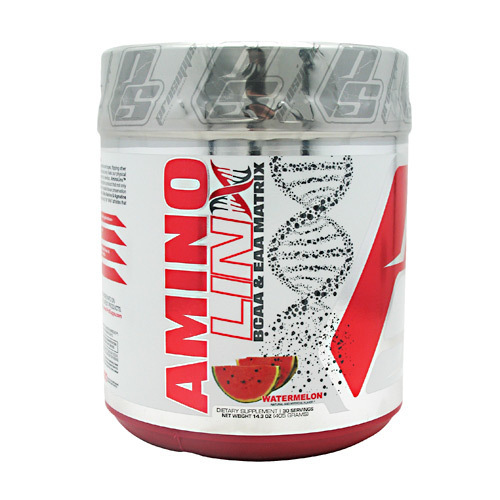 ProSupps AminoLinx is a stimulant-free formula of workout-driven ingredients. 警告: Consult your physician prior to using this product if you are pregnant, nursing or taking medication, under the age of 18, or have a medical condition. Discontinue use two weeks prior to surgery. Store in a cool, dry place. Contents sold by weight not volume; some settling may occur, protect from heat, light and moisture. 注意事项: Manufactured in a facility that processes milk, soy, wheat, tree nuts, and shellfish. Free of sugar, gluten and artificial flavor. 推荐用法: AminoLinx can be taken any time of the day for amino acid supplementation. Loaded with performance-proven ingredients such as beta alanine, citruline malate, agmatine sulfate and CISSUS for joint support, there isn't a more complete Amino product on the market, period. Your supplements should work as hard as you do...prosupps aminolinx. For best results stack AminoLinx with Mr. Hyde, Dr Jekyll and/or Karbolic. AminoLinx can be consumed on both training non training days.